This Thursday, December 17th at 9:30 we would like to invite you to watch Recipe for a Meeting, a TV-TV program produced by YNKB in collaboration with Kajsa Dahlberg and Ilya Lipkin. The program will air on Kanal Hovedstaden. There will also be a dinner and a second screening of the program at 18:00 Friday, December 18th at YNKB. Conceived as a response to the COP15 summit in København, we see this program as the record of an experiment in collective subjectivity. Working with footage of the city, a demonstration, bodies in space, cooking and a shadow play, we attempt to think through an alternate vision of the images surrounding this event. Together, we intervene into the climate of spectacle that the summit has produced in order to ask the question of what a different conception of politics and subjectivity could look like. Hearing: For and against MSC- labelling of fish. December the 16th, 16 – 18 hrs in DGI-byen. How does people in Birzeit want to represent themselves? family memories, artifacts, photos, tools, handcraft, textiles, video interviews, books, stories etc. which tells about life in Birzeit now and then. An amazing collection thanks to donations and loans from people in Birzeit. Peoples Museum is an art project initiated by the Danish art groups YNKB and Parfyme in collaboration with Palestinian artists. Weed workshop number 2. Like the previous weed workshop on alt_cph in september 2008 (see weed 2) we will go out in the area for now to pick up the vitamin-containing weeds of the spring and prepare it for a meal in YNKB. 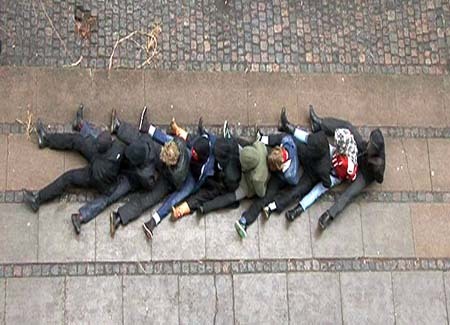 The Art Group “UTE” is organized by Tuss Marie Lysén, Christel Lundberg, Aida Ghardagian, Bekim Gasi & Emma Gunnarsson, who implements the project “Brännaren 2” on Friday the 29th of May 2009 from 5 to 12 pm. “Brännaren 2” is implemented on the area Brännaren 2. This is an industrial area which is going tp be exploated. The only buildig back on the area is the staff building of the previous ammonia factory. The project will deal with the context of the site indifferent poetic and artistic ways, with soundworks, installations etc. Filmscreenings will be between 10 and 12 pm. LET’S RE-MAKE THE WORLD This book is a collection of documentation and writing around exhibitions and seminars that took place over several years and one ocean. 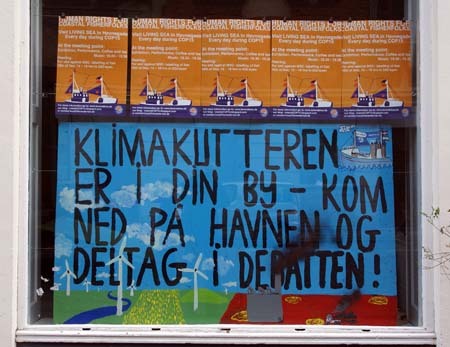 It represents collaboration between the organizers, Ydre Nørrebro Kultur Bureau (YNKB) and The Library of Radiant Optimism for Let’s Re-make the World (Brett Bloom + Bonnie Fortune), and the participants at those exhibitions and seminars. It represents ideas bubbling up and then fading or conversely, gaining traction and sustainability among a dispersed group of practitioners. It represents a beginning. Astrid Noack is one of the most important danish sculptors in the twentieth century. She lived and worked from 1936 to 1950 in a back building to Rådmandsgade 34, a former stable. Here was some of her most famous sculpturs created. The art historian Hanne Pedersen, who just published the book:”Stærkere end livet” will give a lecture on the library of Nørrebro on Astrid Noack, here work and life in Rådmandsgade on Thrursday the 26 of February. The studio of Astrid Noack is stille there. Whaty is going to happen with these old buildings worth of preservation in a unique backyard millieu? Can we create a cultural memorial for Astrid Noack on the site? - perhaps with cultural activities for children? 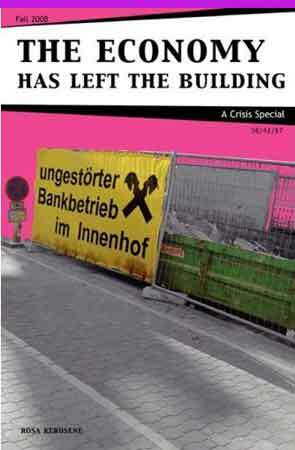 A key task of this journal is to introduce the market 'failure' of a capitalist economy – the repressive destructive nature of a system that works forthe few at the expense of the many – into the comfortable discussions on how universities might best suit the interests of the labour market; or how everyone might best become a professional member of the creative middle class. This debate must be set against the economic and political reality of massive debt, price hikes, wage decreases, and the general squeeze on labour, within the context of what can only be described as capitalism's ongoing and permanent state of crisis. Sophie Schasiepen from the Rosa Kerosene group, who published "The Economy has left The Building" came to YNKB to introduce the Magazine. 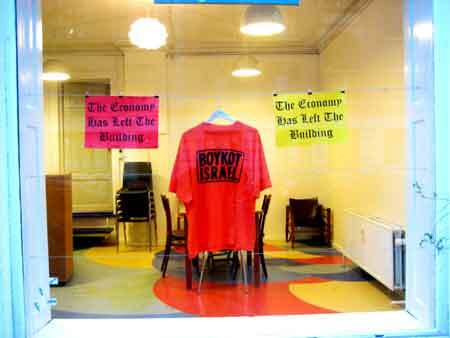 It all started when we hang up a t-shirt in the window with the text: Boycot Israel, as a reacion to the massacre in Gaza. The day after we recieved a mail saying this was a vulgar and undifferentiated attitude. We answered the mail and the exhibition in the window was extended with posters of Palestinian Artists, critical articles and other stuff.